In the late 1990s, the Capital Regional District extended their sewer trunk lines to the Westshore. The City of Colwood held a public referendum asking whether property owners were in favour of bringing sewers to the whole community at public expense. The referendum was defeated. Therefore, the City created several Local Area Services where only those property owners that were actively asking for sewers shouldered the annual taxes to pay for the sewers. At that time, the City followed the sewer connection and billing processes outlined by the provincial government. But when the province changed the law governing Local Area Services, the way Colwood services were first established was no longer consistent. This situation resulted in successful legal challenges to the City’s sewer connection and billing practices. In 2011, the City negotiated a settlement with the provincial government and the Local Area Service members which included a consistent connection process, equitably distributed tax rates, and a reduction in rates for the overwhelming majority of sewer tax payers. The settlement also required that the City offer an extension of the Central Sewer Local Area Service along portions of Sooke Road and Metchosin Road. For properties that are adjacent to existing sewer lines, the typical cost for a sewer service connection in Colwood is approximately $9100. This includes the cost for the City to create a connection from the sewer line to the property line (approx. $6000), and the sewer enhancement fee ($3077 for a single family home). There is an additional cost for the homeowner to install a connection from the property line to their home and decommission their existing septic system (approx. $3000-$5000. This amount can vary enormously depending on the size of property and the nature of the ground.) In order to connect, a property must be a member of their Local Area Service. Colwood property owners interested in connecting to an existing sewer line are encouraged to contact the Engineering Department at 250-478-5999 or info@colwood.ca to get the process started. A Local Area Service is a service that is paid for by those who will directly benefit from it. For example, a neighbourhood may be willing to get together and pay to have sidewalks, lighting or sewer lines installed. These services usually do not meet normal municipal criteria to be funded capital works, yet are sufficiently desired by the residents. 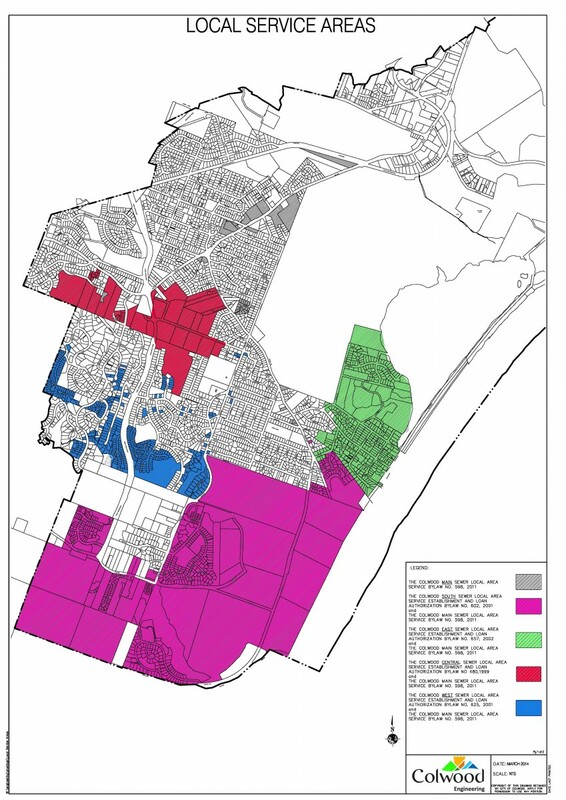 When a property owner proposes an initiative, the City provides that owner with a petition to determine whether neighbouring property owners support the initiative. A successful petition normally has signatures from at least two-thirds of affected property owners although there are other options for the approval process. If a majority of local owners support a proposed initiative, it is brought to City Council for decisions about approval and funding. Colwood property owners interested in initiating a Local Area Service are encouraged to contact the Engineering Department at 250-478-5999 or info@colwood.ca to get the process started. Funding is not currently available to the City to provide sewer extensions in other areas at this time, unless property owners in a defined area are willing to establish a Local Area Service and pay for pipe extensions through their taxes. Property owners should contact the Engineering Department to discuss the possibility. A Sewer Master Plan was completed in May 2013 to outline a plan for servicing all of Colwood over time as funding becomes available. The map below shows Colwood Local Service Areas for sewers (click the image to view it as a large pdf). This map is subject to change.